[cs_content][cs_section parallax=”false” style=”margin: 0px;padding: 0px;”][cs_row inner_container=”true” marginless_columns=”false” style=”margin: 0px auto;padding: 0px;”][cs_column fade=”false” fade_animation=”in” fade_animation_offset=”45px” fade_duration=”750″ type=”1/1″ class=”cs-ta-center” style=”padding: 0px;”][x_image type=”none” src=”https://www.stadiumblueprintcompany.com/wp-content/uploads/2016/04/Robert4.png” alt=”” link=”false” href=”#” title=”” target=”” info=”none” info_place=”top” info_trigger=”hover” info_content=””][/cs_column][/cs_row][cs_row inner_container=”true” marginless_columns=”false” style=”margin: 0px auto;padding: 0px;”][cs_column fade=”false” fade_animation=”in” fade_animation_offset=”45px” fade_duration=”750″ type=”1/1″ class=”cs-ta-left” style=”padding: 0px;”][x_custom_headline level=”h4″ looks_like=”h5″ accent=”false” class=”cs-ta-left man”]Architectural Renderings of Dogs? Yes, from a Capistrano Artist’s Blueprint-Style Collection[/x_custom_headline][x_gap size=”20px”][cs_text]San Juan Capistrano artist Robert Redding has a knack for melding the everyday with the outlandlish and coming up with something as sentimental as it is humorous. And it all started with a fascination with blueprints — which started in 2009 when Redding was redoing his family’s San Juan Capistrano home. His friend, an architect, had shown him plans for the remodel. They got Redding, a graphic designer who had made a career in fashion and design for companies like Quiksilver and Tommy Bahama, thinking about what he’d like to create artistically in the blueprint style used by construction professionals in the 1950s. Instead of a home, why not try to architecturally render a loyal four-legged friend? To make an accurate drawing of a breed, Redding collaborated with the American Kennel Club, an organization providing information on all pedigrees, to make sure the specifics, like height and weight of a dog, were correct. 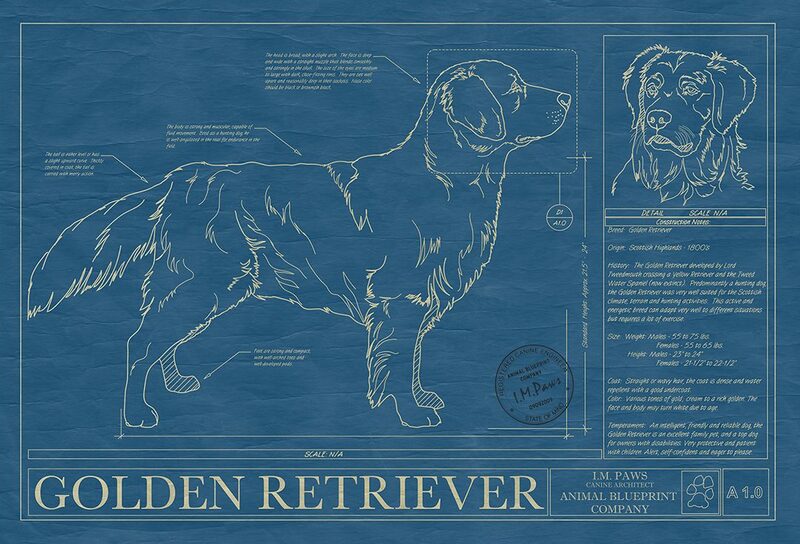 Each illustration includes “construction notes” on the history of the breed, coat, color and temperament and is finished with a bit of humor. In reference to renowned architect I.M. Pei, who designed the Louvre Pyramid in Paris, the works are credited to I.M. Paws Canine Architect. Redding said he has studied dogs so intensely that he can identify just about any breed. While his dog prints continue to be wildly popular — because, he said, he and customers are passionate about their pets — he also wanted to focus on his other passion, sports. For the past three years, Redding has studied the exteriors and interiors of Major League Baseball and college football stadiums. He sketches each sports arena in his standard blueprint style. 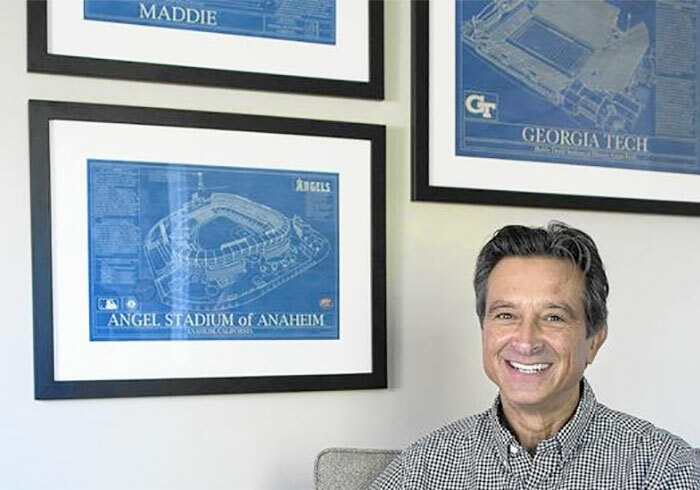 Stadiums are art, he said, proving his point with a collection of 17 college stadiums, including Clemson University, Texas Tech University and UC Berkeley. In 2010, Redding launched the Animal Blueprint Co. He only had 12 dog breed renderings. NBC New York listed the artistic depictions as a gift recommendation. Redding still does not know how the television producers found his site. What followed was a collaboration with Uncommon Goods, a company that serves as a platform for designers and artists to sell their artwork or other products online and through a catalog. “It just snowballed from there,” Redding said, noting that the illustrations are printed on museum-grade and archival paper, ensuring that they will not fade or crack over time. Soon he was getting orders from Sweden, Germany, Australia, France and Canada via his website. Redding has templates for 138 purebreds, but he will also do custom portraits of mutts. The artist also can draw cats and horses, and one time he illustrated a bear, but dogs, he said, remain the most popular. Many customers ask for the labradoodle print. He said he asks customers to send him photos of their pet, and then he’ll research the breed to find a standard image that epitomizes the dog’s characteristics. For custom portraits, he likes to include the dog’s name and any special comments or descriptions of the animal’s personality. The price ranges from $340 to $495. But the project he is most excited about is his Stadium Blueprint Co. When he was 12, Redding said, he wanted to be an artist or a professional baseball player. But after recognizing that he couldn’t hit a curve ball, he focused on drawing and photography. He thought about his love for the sport and how fans would be just as enthusiastic for their teams, so he first drew a blueprint of Ebbets Field, the old stadium in New York City that was demolished in 1960. A month went by and it didn’t sell. He stopped drawing the historic and began rendering current stadiums. Today, top sellers are Yankee Stadium, Wrigley Field, Fenway Park and AT&T Park because of the Giants’ third World Series championship in five years. Redding said he offers all Major League Baseball stadiums except for the Rockies, for copyright purposes, and Toronto Blue Jays, since the New York-based Uncommon Goods doesn’t ship to Canada. “Thank God they lost in the playoffs,” he said with a laugh. Redding recently expanded with college football stadiums. He’ll go through books, magazines and online websites to find aerial photographs of each football stadium. It’s a lengthy process to offer favorite teams, Redding said, since he has to gain compliance from each collegiate trademark licensing office. Two dozen colleges have given him approval, including the University of Oklahoma, University of Alabama and Brigham Young University. He’s waiting to hear back from USC, UCLA, Notre Dame and Stanford.